We've found another Earthlike planet, but what secrets does it hold? The entire world is thrilled by the discovery of a new, Earthlike planet. Advance imaging shows that the planet has oceans of water and a breathable, oxygen-rich atmosphere. Eager to learn more, an exploration team is soon dispatched to explore the planet, now nicknamed New Earth. All the explorers understand that they are essentially on a one-way mission. The trip takes eighty years each way, so even if they are able to get back to Earth, nearly two hundred years will have elapsed. They will have aged only a dozen years thanks to cryonic suspension, but their friends and family will be gone, and the very society they once knew will have changed beyond recognition. The explorers are going into exile, and they know it. They are on this mission not because they were the best available but because they were expendable. 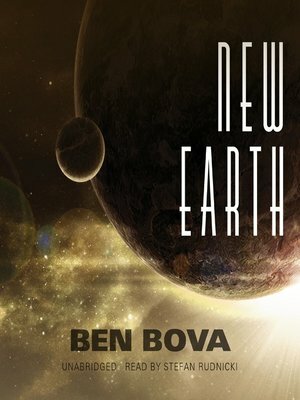 Upon landing, the team discovers something unexpected: New Earth is inhabited by a small group of intelligent creatures who look very much like human beings. Who are these people? Are they native to this world or invaders from elsewhere? While they may seem inordinately friendly to the human explorers, what are their real motivations? What do they want? Moreover, the scientists begin to realize that this planet cannot possibly be natural. They face a startling and nearly unthinkable question: Could New Earth be an artifact?